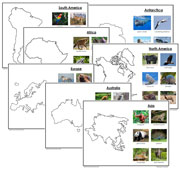 Animals and map outlines for each of the 7 continents. 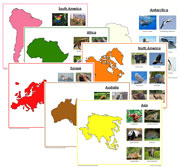 Animals and continent outline for each of the 7 continents. 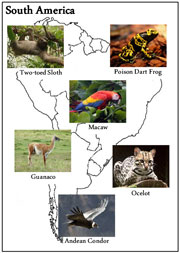 Describes 12 basic cartography concepts. 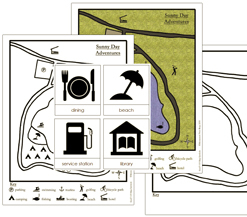 12 Basic concepts of cartography in 3-part cards. 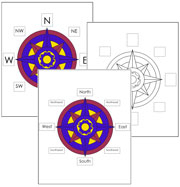 Compass rose worksheets and control charts. 7 Continents of the world in 3-part cards. 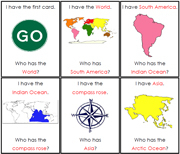 7 Continents of the world in 3-part cards. 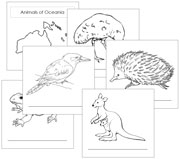 Color each continent to match your own map colors. 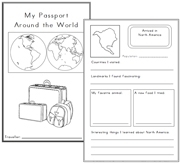 A passport to document traveling through the geography continent boxes. Hemisphere and continent book (satellite images). 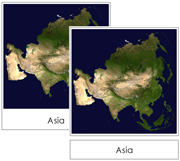 Hemisphere and continent cards (satellite images). 26 Types of homes from around the world. 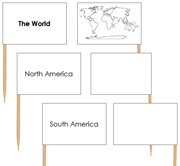 A Fun group game to work on world geography. 36 Map symbols & beginner map. 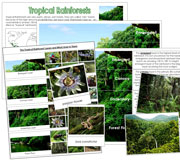 Information and photographs on tropical rainforests. 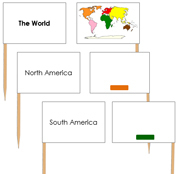 Blank, colored, labeled maps of the 7 continents. 7 Continents of the world and 5 oceans.